In the Bible it is prophesied the most that God will come to do the work of judgment and chastisement in the end time. There are at least over two hundred places in the Bible where it is mentioned that God will come to execute judgment. It can be said that those words all prophesy that God will do the work of judgment and chastisement in the end time. Here only a small number of verses selected can sufficiently prove that God’s coming to execute judgment and chastisement is a necessary step in God’s end-time work. God’s end-time work is a work of purifying and saving and perfecting mankind by means of judgment and chastisement, and is a work of dividing men into their kinds and ending the age by means of judgment and chastisement. From the above 29 verses of the Bible, we all can see clearly the various results the judgment and chastisement that God executes upon mankind can achieve. Besides, God’s end-time judgment is not only directed at one race or one nation, but it must spread to all nations and all peoples and to the whole mankind. So, God’s end-time judgment is a work of ending the old age and opening a new age, and at the same time it can make people see that God rescues humble men and godly men from temptation and keeps the unrighteous under punishment. God’s judgment makes all the people of the world learn righteousness and be able to pursue the truth and know God’s righteous disposition, and makes them subject to God and sing to God and praise God, and all nations will jump and shout and all will bow down and worship God. It fully shows the results achieved through God’s expressing his righteous disposition. And it further proves that God is not only a merciful and loving God, but more importantly, God also has wrath and majesty and judgment and chastisement, and God is a righteous God. In fact, God’s original disposition is mainly the disposition of righteousness. So, when God comes to the world to execute judgment, it is just the time when God’s righteous disposition is fully revealed. Because God’s righteous disposition is revealed, corrupt mankind are after their kinds. Those who can accept and obey God’s end-time judgment and chastisement can all be saved and perfected. Those who reject God’s judgment and chastisement will perish because of resisting God. These are the results directly achieved by God’s judgment and chastisement in the end time. It is God’s righteous judgment and chastisement that purifies mankind and saves mankind and even more perfects mankind. And God’s throne thus can be established on earth, and God’s will will be carried out because of God’s judgment and chastisement. That God comes to the world to execute judgment completely fulfills it that the image of the Son of man in the Revelation of the Bible is the image of the Judge, and it also fulfills the prophecy that “God’s tabernacle descends among men.” Only when God comes to the earth can he save corrupt mankind. Only God’s judgment and chastisement can end this evil age. It is God’s judgment and chastisement that lays the foundation for the coming of the kingdom of God, and so the kingdom of Christ can be realized on earth. This is the sure result and crystallization of God’s accomplishing the management plan of saving mankind. In the end, the assembly of all the saved ones is the kingdom of Christ. And it will fully fulfill the prophecies that “God comes into his kingdom” and “the New Jerusalem comes down out of heaven from God.” It can be seen that the 21st century is the century when God comes into his kingdom, is the century when the kingdom of Christ is realized on earth, and is even more the century when God ends the destiny of satan and comes to the world personally to reign. The millennial kingdom will come true in the 21st century. From many prophecies of the Bible we can fully see that God’s judgment work in the end time is advancing with mighty force and is irresistible. 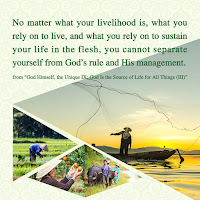 This can even more make people see clearly from the Bible that the three stages of works of God’s saving mankind constitute the entire management plan of God’s saving mankind. Although most of the contents of the Bible are only the accounts of God’s work in the Age of the Law and in the Age of the Grace, the prophecies of the prophets and the prophecies of the Lord Jesus and the prophecies in the Revelation have already fully showed a perfect picture of God’s work in the end time, that is, the judgment and chastisement in the Age of Kingdom, so that all people can see clearly from the Bible the three stages of works in God’s management plan. God in the end time is to save mankind and divide them into their kinds by means of judgment and chastisement and then end this evil and corrupt and dark age. This is a fact that can be seen clearly and cannot be denied. If one cannot see from the Bible the three stages of works of God’s saving mankind, he is absolutely not one who understands the Bible and absolutely not one who knows God’s work. As all people are looking forward to the Lord Jesus’ coming again, God has long been incarnated and descended to Mainland China in a hidden way. It has fully fulfilled the words of God “But of that day and that hour knows no man, no, not the angels which are in heaven, neither the Son, but the Father” (Mk. 13:32). 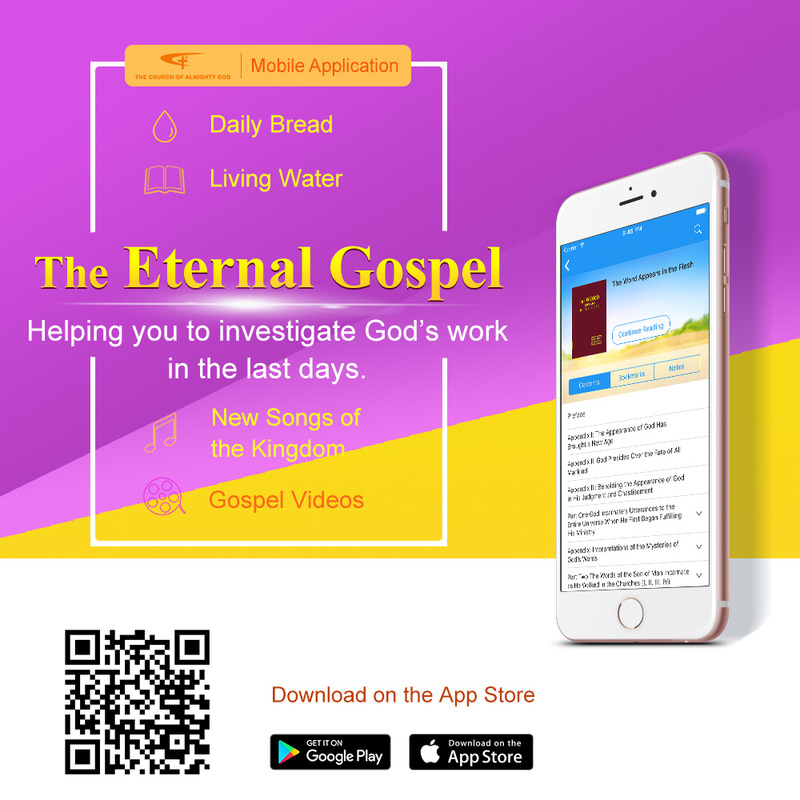 Almighty God expresses millions of words in total, and formally raises the curtain of the judgment of the great white throne in the end time, and judgment has begun with the family of God. God’s chosen people in China have finally seen God’s appearing in God’s judgment and chastisement. It is God’s word that testifies God’s incarnation, and it is the Holy Spirit’s utterance and word that testifies the work of judgment and chastisement God personally does in the world; so God’s chosen people all submit to the authority of God’s word and accept God’s judgment and chastisement, pruning and dealing, and all kinds of trials and refinings, and at the same time they also experience the hunting and persecution from the great red dragon and all kinds of tribulations and suffer many painful refinings. Now, God has finally conquered and saved and made complete a group of people who are of one heart and one mind with him. As Almighty God says in his personal utterance, “I … will not lightly let go any doings of anyone. I will search the whole earth and will appear as righteousness, majesty, wrath, and chastisement in the East of the world, appearing to all men!” (from “The 26th Piece of Word” of God’s Utterance to the Entire Universe in The Word Appears in the Flesh). It can be seen that God’s judgment of the great white throne in the end time has already begun and it has completely fulfilled and accomplished all the prophecies of the Bible. Let’s see how God does the work of judgment and chastisement in the Age of Kingdom. Here it is necessary to quote the words of Almighty God to testify God’s end-time work. First, God’s judgment has made them sincerely convinced and made them realize that only God’s judgment and chastisement in the end time can truly save people and perfect people. Second, God’s judgment has made them know that the true condition and the nature and substance of corrupt mankind are that they are exactly the offspring of satan and the brood of resisting God. Third, God’s judgment has made them fully see clearly the true face of the great red dragon, satan the devil, so that they can hate and rebel against the great red dragon and truly return to God. Fourth, God’s judgment has made them fully see clearly the root cause of the darkness and evil of the world and see that mankind have been so deeply corrupted that they have become devils and have had no humanity. Fifth, God’s judgment has made them understand many truths and made them have great faith so that they can forsake everything to genuinely spend for God and do their utmost to perform their duty well. Sixth, God’s judgment has made them thirst for pursuing to gain the truth and have a will to pursue the truth and know God and live out a true human life. Seventh, God’s judgment has made them see clearly that God likes honest people and that only if they cast off crookedness and craftiness and pursue to be honest people will they have the likeness of a real man. Eighth, God’s judgment has made them know that only loving God is most meaningful and only when their heart loves God can they perform their duty well and be faithful to God and thus be compatible with Christ. Ninth, God’s judgment has made them know that the truth is most precious, and only when they gain the truth will they have life, and only when they gain the truth can they be approved by God. Tenth, God’s judgment has made them know God’s righteous disposition and know God’s wisdom and almightiness, and so they all can spend for God genuinely and submit to God’s manipulation. Thus it can be seen that what God’s judgment and chastisement brings to mankind is salvation and perfection and is even more God’s true love and God’s perfect love. God’s judgment and chastisement in the end time is really too meaningful to mankind’s being saved and perfected. Only the work of judgment and chastisement can make people truly return to God and obey God’s work and truly hate and rebel against the great red dragon and live out the likeness of a real man. Only those who experience God’s judgment and chastisement in the end time can truly know God and love God and thus be compatible with God and obey God and worship God forever and never resist God or rebel against God. Only this is the true meaning of being saved. If there was no God’s judgment and chastisement in the end time, mankind would never truly know the true condition and substance of mankind’s being corrupted by satan, would never truly know the root cause of the darkness and evil of the world, would never hate and rebel against the great red dragon, and could never break away from satan’s influence of darkness. Without God’s judgment and chastisement in the end time, mankind would never know God’s righteous disposition. Without God’s judgment and chastisement in the end time, mankind could never gain the truth and be transformed into new men and enter into God’s kingdom. Only God’s judgment and chastisement can save mankind and bring mankind into the real destination. Because mankind have been too deeply corrupted, even if they have been forgiven of their sins and enjoyed much of God’s grace by believing in Jesus, because they have the nature of resisting God, they can still resist God and rebel against God. Therefore, they cannot truly break away from the influence of satan and be saved. We all can see clearly that although those believers in Jesus in religion can zealously testify that Jesus is the Redeemer, because they do not know God’s righteous disposition, when the end-time Christ comes again, they can still resist God’s end-time work, judge and condemn the true way, and deny God’s coming again, and can even crucify Christ. So, such people who only experience God’s redemption in the Age of the Grace yet do not experience the judgment and chastisement of Jesus’ coming again are not ones who do the will of the heavenly Father and are not qualified to enter into the kingdom of heaven. This is because they still have not resolved their nature of resisting God and still lack too many truths and are far from knowing God and obeying God, and especially when God comes to do the end-time work, they can still judge and condemn God’s end-time work and play the role of satan to resist God and become the enemies of Christ. So, it can be seen that none of those who do not accept the work of Jesus’ coming again to receive the truth as their life is one who is truly saved. So, corrupt mankind need the salvation of the incarnated God, that is, they must experience God’s judgment and chastisement in the end time, and only thus can they truly know God and obey God, and only such people are the ones who do the will of the heavenly Father and can gain God’s approval and enter into the kingdom of heaven. There is no doubt about it. First, although they believe in their heart that there is a God and acknowledge that everyone has sins and also pray and confess their sins often, they never have true repentance and transformation. Second, they show love to others but have no truth and principles and even show love to devils, satans, and evil spirits, which is a foolish love. Third, they do not know men’s true corrupt condition and their nature and substance, and they only acknowledge that they have sins but cannot see clearly the substance and thus do not truly know themselves. Fourth, they cannot see clearly the dark and evil substance of the age and can even follow the evil trend of the world and have no way to break away from the influence of satan. Fifth, they all worship pastors and famous men in believing in God. Nominally they are believing in God, yet they are following men and being restrained by men, and they have an obstinate and blind faith in the Bible and take the way of antichrists. Sixth, they only believe that God is merciful and kind and will forgive people no matter how many sins they commit, yet they do not know that God’s disposition is also righteousness, judgment and wrath. Seventh, they only understand the letters of the Bible but do not understand God’s will and are prone to apply regulations mechanically, and they can also take the verses out of context and misinterpret them according to the letters of the Bible. Eighth, they cannot treat the Bible correctly according to the historical facts and treat the words of apostles all as God’s word, thus causing the chaos that many denominations exist. Ninth, they do not know the working of the Holy Spirit and even treat the working of the evil spirits as the working of the Holy Spirit, which allows the evil spirits to disturb and damage the church and deceive people. Tenth, they worship the Bible as God and circumscribe God, judge God, and resist God with the Bible and do not seek the truth and even less seek God’s appearing. The above ten manifestations are sufficient to show that the believers in Jesus who remain in the Age of the Grace have long fallen behind the footsteps of God’s working, and they have no growth in life at all and still remain in the initial stage of believing in God. They believe in God yet do not know God and can still resist God and rebel against God and even become God’s enemies. They have not broken away from the influence of satan and been saved at all. How pitiable and sorrowful it is! Think back to the Age of the Grace. The deeply corrupted mankind could nail the Lord Jesus to the cross. What on earth is the nature of that matter? They could hand the Lord Jesus who preached the way of the kingdom of heaven over to satan and even said that Jesus must be crucified and they would rather release the robber than crucify Jesus. Aren’t such corrupt mankind devils? Only devils can hate God so much and be God’s sworn enemies. The Jewish chief priests and teachers of the law and so many believers at that time could shout with one voice that Jesus must be crucified. Weren’t they a group of devils that hate God? Now, aren’t most pastors and leaders and many believers in the religious world also condemning Almighty God with one accord? Aren’t they a group of devils being hostile to God? Particularly, just when the great red dragon is frenziedly resisting and condemning God’s work, the religious world also stands on the side of the great red dragon and even joins hands with it to resist God and condemn God and blaspheme God. This makes mankind see with their own eyes the fact that the religious world and the great red dragon are on the same front and they both belong to satan’s camp. The religious world has long become satan’s accomplice and confederate, and its substance of “serving God” yet resisting God is completely exposed. This thus fully proves that the words with which Jesus exposed and judged the Pharisees in Judaism are just the corrupt and evil substance of the religious world of today. The religious world in the end time resists God more seriously than the religious world at Jesus’ time, and they are both groups of the antichrists, the devils, rejected and condemned by God, and they completely belong to the evil forces of satan. From here we can see that mankind have been corrupted to the utmost and they can even crucify the Christ who expresses the truth and executes judgment in the end time. This is sufficient to show that mankind have been corrupted by satan and become devils. God’s judgment work in the end time is exactly to transform the devil that has been corrupted by satan into a man. What an arduous work it will be! So, it is most suitable for God to save mankind by means of judgment and chastisement in the end time. God’s judgment and chastisement is just proper for saving corrupt mankind. This is because corrupt mankind are not simply disobeying God and resisting God, but they have long become God’s hostile forces and God’s enemies and the offspring of satan that resist God. That is why corrupt mankind, especially the religious world, can take the Christ who expresses the truth and saves men as their deadly enemy, and they only wish to crucify him to vent their hatred. Can such corrupt mankind be without judgment and chastisement? Absolutely not. For mankind are too evil and too malicious and they have long become the offspring of satan and the evil forces that are hostile to God obstinately. Therefore, to say that corrupt mankind are devils is exactly appropriate and is not excessive at all. Actually, God’s judgment and chastisement in the end time is exactly a work to end the destiny of satan. Can God let off those antichrists, the devils in the religious world that are hostile to the incarnated practical God in the end time? We can wait and see what scene it will be after all nations and all peoples see God’s public appearing. Why will all people wail? At that time the whole truth will be revealed! The Lord Jesus in the Age of the Grace had promised mankind that he would come again. So, in the end time, mankind are all expecting to welcome the Lord Jesus’ second coming. No one has ever thought that when God comes again, this deeply corrupted mankind can actually hate Christ and hate the truth so ferociously, and they can even crucify the end-time Christ. This is corrupt mankind’s second contact and collision with God, and corrupt mankind have again committed a monstrous sin of crucifying the Christ who saves mankind. Isn’t this worth mankind’s deep self-examination? Condemning the judgment work of Christ in the end time is the most serious sin of blaspheming the Holy Spirit. If people in the religious world do not truly repent, it is self-evident that what destinations they will have. When mankind contacted and collided with God the first time, it was in the Age of the Grace. When God was incarnated for the first time, that is, when the Lord Jesus came to the world and began to preach and work, he was crucified alive by the religious world of Judaism at that time, this gang of evil mankind. They committed a monstrous sin. When all those who believe in God in the religious world are preparing for welcoming God’s coming again in the end time, God accepts the invitation and is incarnated in Mainland China, and then judgment begins with the family of God. Then the incarnated Almighty God is condemned by the whole religious world and the great red dragon, and the voice of crucifying the end-time Christ is even higher in the religious world. Fortunately, God incarnate in the end time comes to do the work of judgment and chastisement, not to do the redemptive work again, so satan’s scheme to arrest and kill God is not successful. But in essence the tragedy of crucifying the last Christ is on. That is, the religious world and the great red dragon condemn God’s work together and fabricate many lies to judge and condemn and blaspheme God, and they chase Christ and the man used by the Holy Spirit everywhere, committing a monstrous sin. This is corrupt mankind’s second contact and collision with God. The fact has sufficiently shown that corrupt mankind in the end time have been corrupted to the extreme, and it is time for God’s righteous disposition to be revealed completely. The evil and corruption of the mankind in the end time are more serious than that of Sodom. It fulfills the prophecy of Jesus: “But as the days of Noe were, so shall also the coming of the Son of man be” (Matt. 24:37). People are busy with eating and drinking and marrying and giving in marriage, and they advocate evil and are extremely licentious, which have long provoked God’s wrath. If mankind do not accept God’s judgment and chastisement in the end time, they absolutely cannot be truly saved. For in the religious world the pastors and leaders and those people deceived and controlled by them are still judging and condemning God’s work now and are still doing their utmost to deny the last Christ. By doing so, they have already crucified Christ. Do people who hate the truth and are hostile to God like this still have the qualification and face to wait for being caught up? This fulfills these words of the Lord Jesus: “Not every one that said to me, Lord, Lord, shall enter into the kingdom of heaven; but he that does the will of my Father which is in heaven. Many will say to me in that day, Lord, Lord, have we not prophesied in your name? and in your name have cast out devils? and in your name done many wonderful works? And then will I profess to them, I never knew you: depart from me, you that work iniquity” (Matt. 7:21-23); “He that rejects me, and receives not my words, has one that judges him: the word that I have spoken, the same shall judge him in the last day” (John 12:48). That “judge him in the last day” refers to the judgment work the Lord Jesus does when he comes again. The believers in God who remain in the Age of the Grace all think absurdly that the redemptive work God did is the last stage of work of God’s saving mankind, and so God will not do the work of judgment and chastisement. This is really misinterpreting the Bible and judging God’s work. All the prophecies of the Lord Jesus in the Age of the Grace have been fulfilled and accomplished in the God’s end-time work. If the redemptive work in the Age of the Grace was God’s final work of salvation, then why did Jesus say that he would come again? Jesus comes again just for fulfilling and accomplishing all the prophecies he spoke in the Age of the Grace, just for saving men from the influence of satan through judgment and chastisement so that they can truly return to God, just for dealing with the sinful nature which, puzzling men in the Age of the Grace, causes them to commit and confess sins repeatedly in spite of themselves and be unable to extricate themselves from them, so as to transform their disposition and cause them to truly know God and obey God and thus can be compatible with God, and just for dividing men into their kinds and ending this dark and evil age. Only thus can the saints be taken up into the kingdom of God. And only this is the real meaning of God’s doing the work of salvation. If God’s work could not achieve such results in the end, God’s prophecies would not be truly fulfilled and accomplished and God’s management plan of saving mankind would not end. So, God’s management work of saving mankind absolutely will not end up with two stages of works, and there must be the work of God’s judgment and chastisement and dividing men into their kinds in the end time. Only in this way can God’s management plan of saving mankind be accomplished, and only thus can God completely overcome satan and truly gain the glory in the war against satan. Now, after having experienced God’s work of judgment and chastisement in the end time, God’s chosen people in China have all entered the right track of believing in God and have already had a foundation on the true way. In God’s warring against satan in the end-time work, God uses the great red dragon as a setoff and a service-doer, and at the same time uses the performances of all kinds of false leaders, antichrists, and evil spirits to make God’s chosen people have richer experiences. Just as attending the great banquet of Christ, they receive God’s great love. Particularly, after experiencing many wars between justice and evil, God’s chosen people have broadened their horizons and gained insight, and have known many truths and mastered many principles of practice and finally entered into the reality of the truth. Those who pursue the truth have all understood many practical matters that people must face in believing in God, such as, what is resisting God and what is obeying God; what is spending for God genuinely and what is performing the duty in a qualified way; what is corrupt humanity and what is normal humanity; what is true love and what is hypocrisy; what are letters and doctrines and what is the reality of the truth; what is loving God and what is deception; what is from God and what is from satan; what are positive things and what are negative things; what is light and what is darkness; what is of God and what is of satan; what is being compatible with God and what is being hostile to God; what is breaking away from the influence of satan and what is being truly saved; what are false leaders and antichrists and what is knowing God and serving God, and so on. All these practical matters have been solved in their experiencing God’s judgment and chastisement. Now, God’s hidden work in Mainland China has entered into the final stage of spreading the kingdom gospel. God’s chosen people are all pursuing the truth and trying their best to perform their duty well and prepare good deeds and exert all their strength to preach the gospel and testify God and welcome God’s public appearing with good and resounding testimonies. This has sufficiently shown that God has overcome satan, God’s hidden work in Mainland China will end with glory, and God will soon appear publicly to every nation and every place and every race and every tribe.